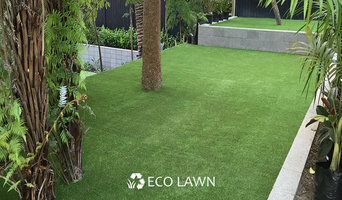 Eco Lawn is no maintenance, no mowing, no watering, no mud, no puddles, it's not going to dry out, and kids and pets can play on it. We are a small local team that is passionate about transforming landscapes and looking after each customer. We pride ourselves in caring about each job; each client and each detail of the work that we undertake to provide our customers with superior workmanship and a great landscaping experience. Whether you want to shoot hoops with friends or plan a safe kids play area for your little ones, there’s a professional on Houzz that can help you turn your backyard dream into a reality. Sports court and outdoor play specialists design, install, repair, resurface and replace sports surfaces, including tennis courts, basketball courts and playgrounds. They have a thorough knowledge of sport rules, regulations and standards, such as court dimensions and net heights, and are required to stay on top of the latest sporting technologies and flooring systems. They can assist with planning and council approval before construction begins, as well as other unforeseen requirements, such as drainage and retaining walls. Aside from surfacing, they can also provide lighting, fencing and equipment to complete a recreational area. Here are some related professionals and vendors to complement the work of playgrounds and sports: Backyard Courts, Landscape Contractors & Gardeners, Building Project Managers, Carpenters. Find a sports court and outdoor play professional on Houzz. Scroll through this page to find professionals that specialise in playground and sporting surfaces, as well as play equipment and accessories. You can browse their latest projects, read reviews to see how other homeowners rate their work, and message them directly.